In the jungles of Cambodia, archaeologists are using aerial laser surveys to uncover mysterious features, including man-made mounds and geoglyphs arranged in geometric shapes that indicate widespread shaping of the landscape—perhaps greater than at any other pre-industrial region on Earth. 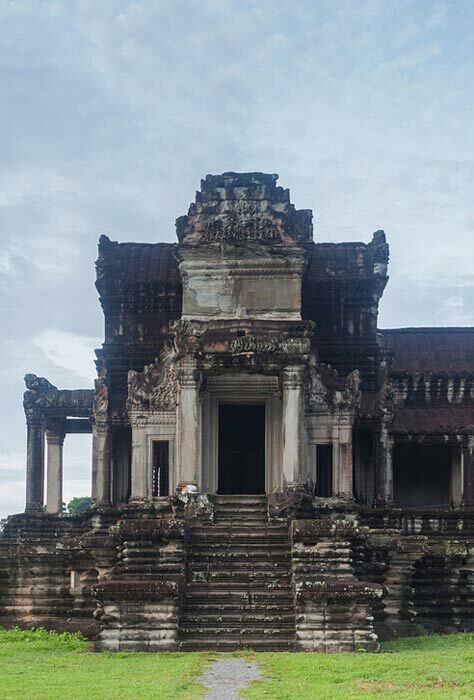 The chief archaeologist of the Cambodian Archaeological LIDAR Initiative, Damian Evans, published an article this month in the Journal of Archaeological Science detailing his work in imaging the heavily worked landscape of the centuries-old Khmer and Angkor civilizations. Dr. Evans is with the École française d'Extrême-Orient. “ALS” stands for airborne laser scanning. The period of the urban features that CAIN scanned is about 2,000 years, from prehistoric times to the transition to modern times. The features include iron-working areas. One problem archaeologists have had in studying the Khmer Empire, a large nation of Southeast Asia that was at its height from the 9 th to 15 th centuries AD, was the people built many of their structures from wood, thatch and earth. Mason construction was limited to temples, bridges, culverts and spillways. Even the Angkor kings’ palaces were made of earth, wood and thatch. So most scholarship on early Khmer society came from study of their architecture, art, history and ancient inscriptions. However, the new surveys are showing the Khmer re-engineered their environment on a scale unparalleled in the pre-industrial world to build “extended agro-urban environments,” Dr. Evans wrote. The Khmer built wooden neighborhoods on tops of earthen mounds to stay above floodwaters during monsoon season. They also excavated many thousands of ponds and canals and made roads, field walls and dykes of earthen embankments. In 2012 and 2015, CALI examined 2,230 square kilometers (1,385 square miles) of land surface in its airborne laser scanning surveys. Targeting an urban area near Angkor Wat, the scientists found that the classic Angkorian city of Mahendraparvata covered 40 to 50 square miles. That city flourished in the 8 th and 9 th centuries AD. 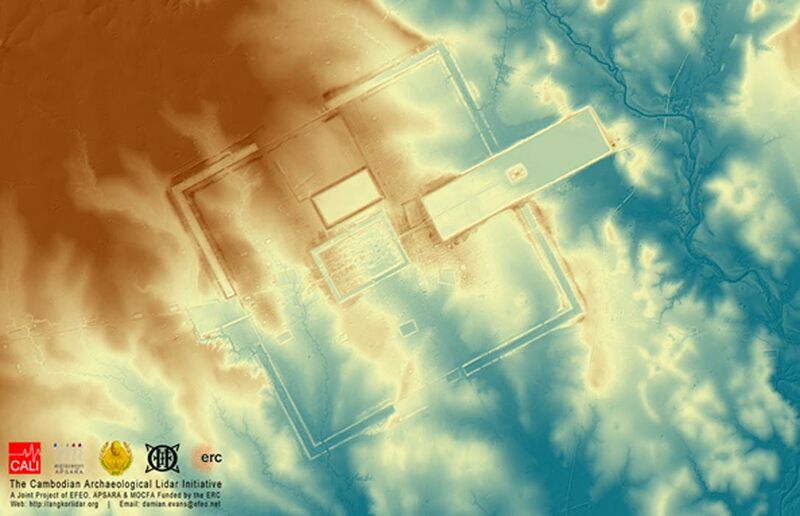 They found that much of the archaeological topography of this city “consists of linear or grid-like arrays of mounds” that may have been water-management features. 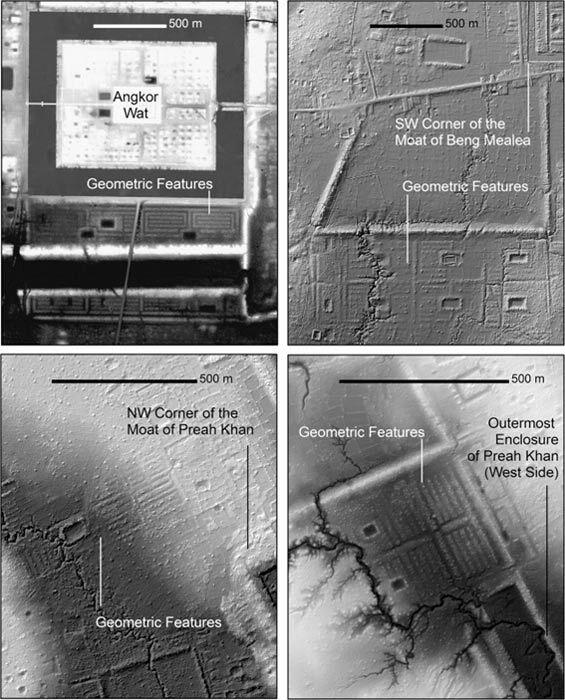 “Equally enigmatic are the geometric rectilinear patterns made from earthen embankments—variously described as ‘coils’, ‘spirals’, ‘geoglyphs’ or ‘gardens’—first identified south of the moat of Angkor Wat in the 2012 data,” Dr. Evans wrote. Scholars have speculated that the Khmer and Angkor societies collapsed because of climate variations coupled with “cumulative environmental degradation, or a lack of adaptability that made the societies vulnerable to transformations occurring at larger spatial and temporal scales (e.g. long-term climate variability).” Another factor, Dr. Evans wrote in his paper, may have been an invasion by a neighboring civilization.